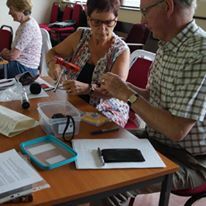 A really successful workshop with Living History Northeast at Margrove Village Hall resulted in eight volunteers receiving training in oral history theory and methodology. Janette Hilton gave a lively and illustrated presentation on the history of oral history before participants in the workshop explored each other’s backgrounds. More information was shared on issues to be aware of when using memories before breaking for lunch. Post lunch the group collectively developed a questionnaire framework for the Where the Wild Things Were project and were then set loose with some trepidation to practice using the new Zoom recorders. All to soon the workshop ended heralded by an almighty downpour of rain. Our thanks to Janette for a really well structured and informative day.